Caucasus (the Greater Caucasus Range and the western part of the Lesser Caucasus). Alpine and subalpine meadows. Rhizome vertical, 10-15 cm long. Basal leaves long-petiolate (10-20 cm), pentagonal, deeply divided, lobes irregulary incised. Stems 1-2, 10-15 cm, sparsly leafy. Flowers in pairs, petals 20 mm x 13-15 mm, bright violet. V - mid-spring to mid-autumn. Fl - July in the wild, in St. Petersburg June. Fr - August. P -easily by seed or division. Requires a moist soil and semishade. Z 4. New. Central Asia (Pamiro Alay). In alpine meadows, on grassy slopes. Stems 15- 30 cm. Leaves deeply divided into 5 segments. Flowers violet with purple venation. V - mid-spring to late autumn. Fl - throughout the summer. Fr - July-September. P - easily by division of rhizome and by seed. Requires a well-drained soil and sunny site protected from the afternoon sun. Very suitable for the rock garden and flower beds. Z 5. Central Asia (Tien Shan). On gravelly talus and scree. 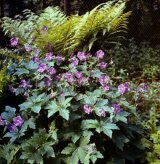 Plant low-growing, 3-5 cm, foliage deeply incised, 5-7 lobed, each lobed futher divided. Flowers pink or purple, in pairs, about 2.5-3.0 cm long. Entire plant pubescent with grey hairs. V - mid spring to late autumn. Fl - mid summer (July, August in the wild). Fr - mid autumn. P - by seed or division. Requires a well-drained soil and a sunny position. Well suited to the rock garden. Z 5. New.